The U.S. Jobs Deficit increased by 72,000 in August, rising from a deficit of 11,760,000 in July to 11,832,000, based on Friday’s Employment Situation Report. The economy added a mere 96,000 jobs in August, while June and July’s numbers were revised downward by 41,000. Thus, the U.S. realized a net gain of 55,000 Nonfarm jobs in the month of August. But since the economy needs to create 127,000 jobs a month in order to keep up with population growth, this resulted in an overall increase to the jobs deficit of 72,000, as compared to the previous report. Here’s the big picture. We had a recession which lasted for the last 12 month’s of the Bush term through the first 6 month’s of Obama’s, not for the last 30 years. Today 12,544,000 Americans are counted as officially unemployed. Another 7,031,000 are unemployed and want jobs, but have dropped out of the labor force and are thus not officially counted. And still another 8,031,000 are employed part-time for economic reasons. The truth is that if Barack Obama’s government-down, borrow-and-spend policies worked, then the jobs deficit wouldn’t be worse-off today than it was in December 2009, yet it is. So enough with the jokes, how many jobs need to be created each month in order to reach full-employment, and how long will it take? And in light of the answer, is four more years of Obama’s deficit spending and light-mindedness the cure? Yet while Barack Obama has elected to waste the last four years of our lives running up the national debt, while capping on conservative economic policies, the U.S. jobs deficit has increased from 5,165,000 in December 2008 to 11,832,000, an increase of 6,667,000 (see chart below). Essentially, what this means is that since Obama implemented his $831 billion Stimulus plan, the economy has been unable to create a sufficient number of jobs for 6,667,000 new entrants, many of whom have been ushered straight out of high school or college into hopelessness and generational dependency. Do you think this is funny? I don’t. Exactly where have four years of Barack Obama’s borrow-and-spend prescription refills landed us? In order to keep up with population growth, we would need to create 127,000 jobs times 28 months, or 3,556,000. Add in the need to make up for the jobs deficit and we’re at around 15,388,000 (3,556,000 + 11,832,000) over the next 28 months — or 549,571 jobs a month. In order to keep up with population growth, we would need to create 127,000 jobs times 60 months, or 7,620,000. Add in the need to make up for the jobs deficit and we’re at around 19,452,000 (7,620,000 + 11,832,000) over the next 60 months — or 324,200 jobs a month. Did the U.S. add 549,571 jobs last month? Nope. In fact we haven’t come anywhere close in any month during the entire Obama recovery. Did employers add 324,200 jobs last month? Nope. In fact, we haven’t even come close to this number in any month during the entire Obama recovery, except for the single month of May 2010, but those were just temporary Census jobs that went away in subsequent months (see the related table). The sad truth is that the U.S. only added 55,000 Nonfarm jobs in August (+96,000 minus 41,000 of previous overstatements). 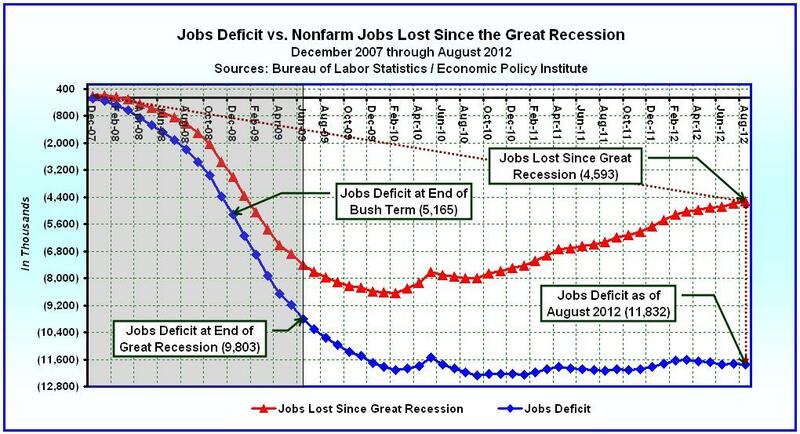 And because the jobs deficit increased by 72,000, we are currently on track towards a permanent decline. In other words, it is impossible to reach full-employment while the jobs deficit is increasing. Thus, we are NOT moving in the right direction, we are moving towards another recession. We have wasted 44 months coping with the unreasonable economic policies of Barack Obama, and what did we get in return? We are worse off today than before he started. At this point, we either need to create 549,571 jobs each and every month to be on a track towards full employment within the next 28 months, or 324,200 jobs each and every month to be on track towards full employment within the next 5 years (which will be more than 8 years from the end of the recession). And although Barack Obama has orated a plan which would add 600,000 new jobs in Natural Gas by 2020 (or over the next 8 years), and 1,000,000 new Manufacturing jobs over the next four years, we are forced to give his plan a grade of “D” for deficient. Under Obama’s government-down, borrow-and-spend economic policies, most of us will indeed be in “a better place” by the time the U.S. reaches full-employment. A lot of my friends, neighbors, and clients lost their jobs, lost their homes, divorced or filed for bankruptcy over the last 3 years and eight months. My neighborhood has been decimated, as our homes have lost a third of their value. Our business revenues have declined and leveled off at a lower tier. And as far as I can see, only one political party offers any hope of turning things around. The Obama-Biden plan includes a goal of creating 1,000,000 new manufacturing jobs over the next four years, which would be great, because their policies have thus far resulted in a loss of 582,000 manufacturing jobs since January 2009. In stark contrast, the Romney-Ryan Plan includes a goal of creating more than 12,000,000 jobs in the next four years, which is entirely doable. I don’t care what the policies are as long as they lead to the desired result. The Obama-Biden goal is deficient. Even if the plan works, it won’t result in a sufficient number of new jobs to even keep pace with population growth (127,000 a month / 1,524,000 per year). In fact, Obama has set the bar so low that his plan is incapable of eliminating the jobs deficit, even if granted a second term. So what’s the point? Based on our current trajectory, Obama’s plan never comes close to full-employment, ever. If you think that adding $5.3 trillion to the national debt over four years, establishing a goal of 1,000,000 new jobs when more than 12,000,000 are needed, and sprinkling it over with meaningless ramblings of a far-left gagman is a plan, then you might need to get your head examined. But if the cure for what ails America today really does involve reducing the growth of government spending, reducing income taxes and capital gains taxes, reducing the number of government regulations, and creating more than 12,000,000 new jobs in the next four years, and you reject it in favor of the former, then God help us all. If you’re still sane after filtering through all the nonsense, then you know what you have to do. Vote for the Plan, there’s only one.